Blue Signal Search is unlike any other recruiting firm of its kind – so naturally, we had to have a holiday party just as unique as we are. 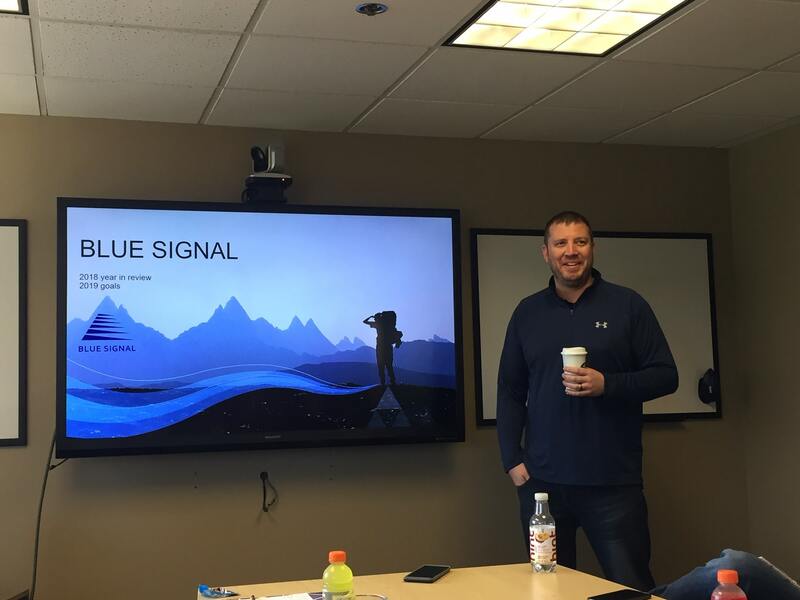 In January of 2019, we held the first annual Blue Signal Summit, a three-day team gathering to celebrate a year of industry success. Each day was jammed packed with learning, team building activities, industry speakers, games, awards, great food and festivities. We were able to wrap up 2018, set goals for 2019 and beyond, as well as celebrate all we have achieved thus far. For the event, our entire staff joined under one roof in our new HQ in Phoenix, Arizona. This was the first time some of us met in person! 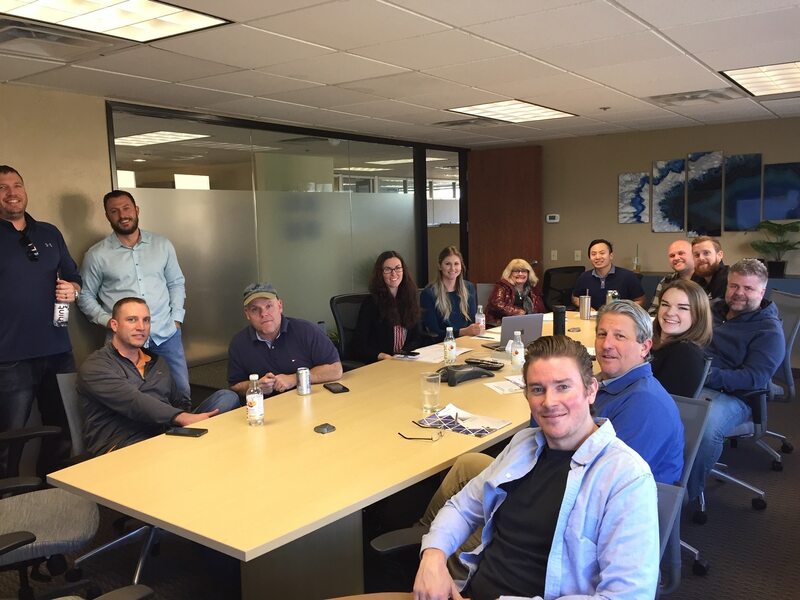 In the spirit of team building, we had meetings where we reviewed our best practices, discussed our company values, and underwent advanced trainings. 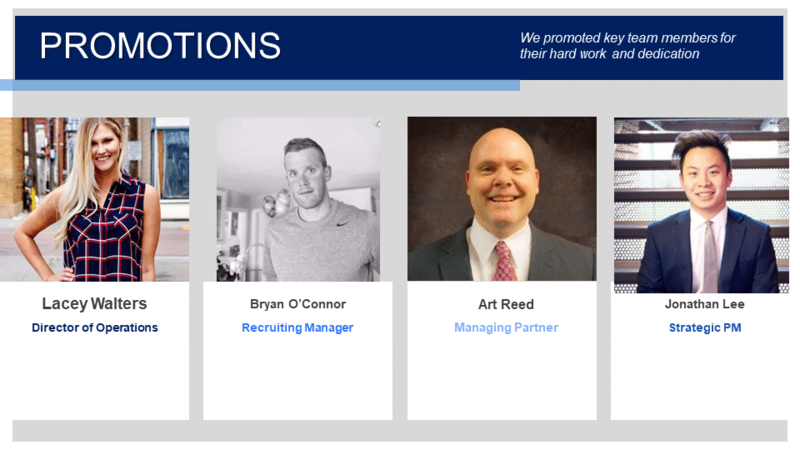 Blue Signal brought in Pinnacle Society elite and top performing recruiter Joe Rice to discuss what is and is not working in recruiting today. We covered objectives about leadership, company culture, change management, and organizational growth. The team learned more about the industry and best practices to better serve our clients and candidates in the future. Throughout our conferences, the team talked about our growth and about fine tuning our processes. We strategized as a company and talked about upcoming initiatives and long-term goals. Most importantly, we recognized the achievements from the last year and awarded those people who helped us get there. In 2018, Blue Signal made 119 placements and worked on over 400 jobs. Our biggest year yet also saw 8 new hires and 4 major promotions. 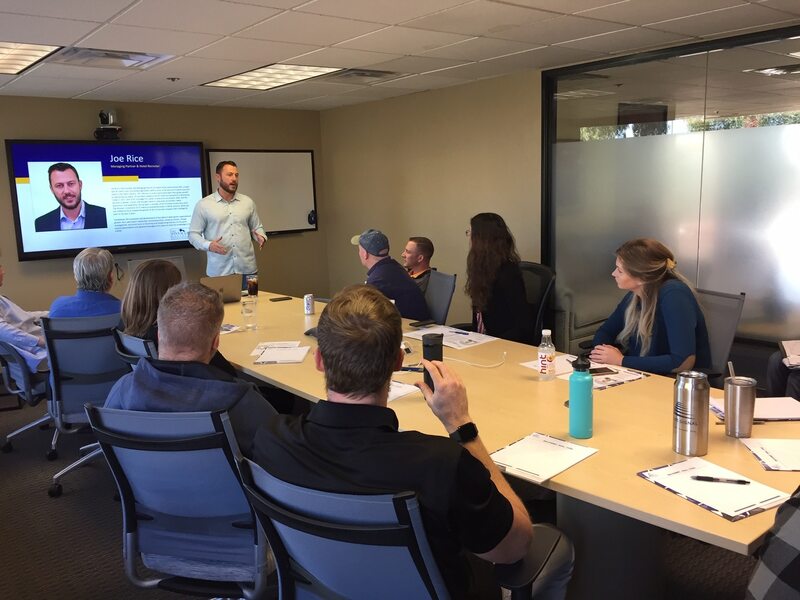 Looking ahead to 2019, we are training and onboarding a new class of 9 recruiters before the end of January. The Summit helped us focus on what is most important – who we are and where we want to be. Saturday, we got together showcase our accomplishments. 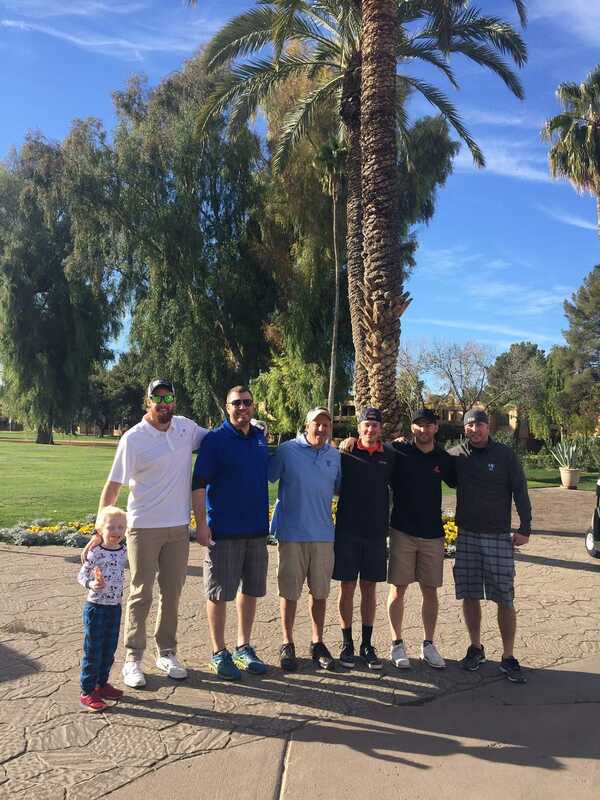 In the morning the sales team had a golf tournament at the Orange Tree Golf Resort. That evening, we met with our significant others at the beautiful Biltmore Hotel to finish the Summit with a formal dinner. This Blue Signal family is proud of 2018’s accomplishments and is ready to do what it takes to become the best recruiting firm on the planet! The US broke many long-standing employment and labor records in 2018, with the effects rippling through all business verticals nationwide. With the 2008 recession now 10 years behind us, the 2018 economy showed strong jobs growth and shrinking unemployment. This is good news for job candidates who are looking to upgrade their jobs. For businesses, however, last decade’s hiring strategies won’t work anymore. The talent pool is shrinking, and updated strategies are a must. Youth unemployment hit its lowest level since 1966. The number of open jobs exceeds unemployed persons by 659,000. The economy has created 2.5 million jobs, representing 66.7 million hires. The Bureau of Labor Statistics reported that April closed with 6.7 million job openings. Unemployment dropped to 3.8%, its lowest level since 1969. Despite high demand, only 50% of employees feel like their wages are competitive with market rates. Despite the longest bull market run in history, candidates don’t always have it easy, either. A recent McKinsey report estimated that 50% of today’s jobs are susceptible to automation by artificial intelligence. This used to be a distant vision of the future, but today, many of these technologies are already available on the market. Half of the tasks employees do today can be automated, reducing the demand for some skills that most people use as leverage in qualifying for a position. Once While less than 5% of all occupations can be automated entirely using technology, about 60% of all occupations have at least 30% of activities that could be automated. 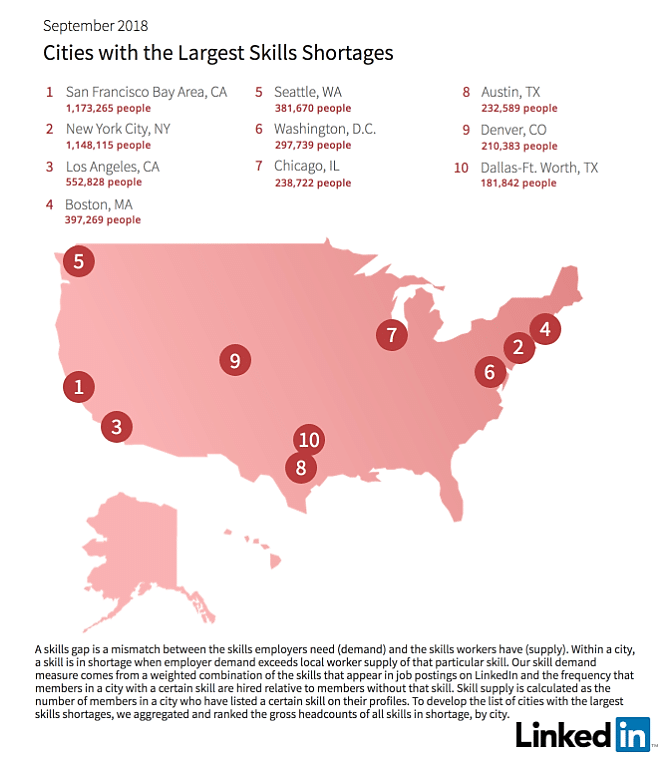 Not to mention the staggering skills shortages throughout the nation. If candidates want to remain marketable, they must learn some new skills. According to a LinkedIn survey, the hard skills companies need most are cloud and distributed computing, statistical analysis and data mining, middleware and integration software, web architecture and development framework, user interface design, software revision control systems, network and information security, and SEO/SEM marketing. The trend is obvious here – companies are desperate for digital skills to keep up with the increasing amount of technology required in modern business. Software development skills, such as performance tuning and SQL are required for over 850,000 open roles right now. To put this in perspective, the talent pool only contains 472,000 professionals with those skills. The need for highly specialized workers is at an all-time high, while the pool of educated and qualified candidates is strikingly low. 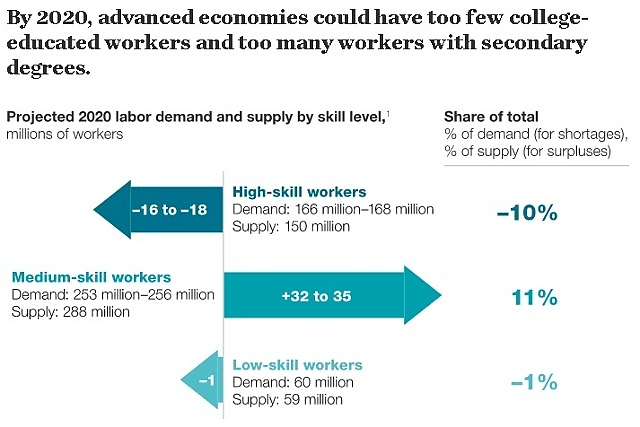 Trends in education levels and projected employment needs indicate that employers will require about 18 million more college-educated workers than will be available in 2020, a gap representing 11% of demand. Complicating the situation is the student debt crisis, called a bubble by many leading economists. The burden of debt is unsustainable based on the earning potential of most college degrees, especially arts, languages, and other non-STEM areas of study. Economists don’t expend a reversal of this trend any time soon. Underqualified talent cannot leverage skills that are universal or able to be automated, lowering performance. Low performance reduces revenue, and therefore capital. Without the capital to modernize, companies cannot compete – in their markets or for gaining candidates. This cycle feeds itself, reducing candidates and marketability, sometimes to the point of bankruptcy. What’s next? Employee development and training is a proven way to reduce turnover. Companies nationwide are investing more in educational programs and expanding the skill set of their internal teams. This can help in modernization and retention, fending off some of the competition poaching. The promise of personal and professional development can be a key factor in a potential candidate’s decision making. If companies want to boost growth, they need the right employees. However, to get the right employees, hiring managers need updated recruiting strategies. They must focus less on what the employee can do for the company, and more on what the company can do for the employee. Today’s professionals are looking for not only financial rewards, but recognition and a future. Despite employer belief, the top reason individuals left their jobs was due to career progression – not salary. Out of the employers surveyed, 48% have a strategy in place to promote company culture to make their company more attractive, and 43% leverage competitive salary packages. What makes your company a place that a qualified, highly-desired candidate wants to work (or in many cases, leave their current company for)? At Blue Signal Search, we call this a company’s “sizzle”. If you are experiencing some of the growing pains of this shrinking talent pool and the digital age, contact us today. We can help you find your true value proposition – your sizzle – and market it to find the right candidate for your open role. Need help with your recruiting strategy? Contact us at (480) 939-3200 or reach out to [email protected]. The average hiring cycle has risen sharply in the past few years (from 13 days to over 23 days). Some positions take even longer—2 months or more to make a hire. All of this lost time slows down team momentum and actually leads to a sloppier hiring process, not a more careful one. Not only that, many of the top job candidates are off the market in 10 days or less. Companies that take a long time to hire are depriving themselves of the best talent in the industry. Start by taking a quick look at the numbers. How long did it take to hire the last 3 employees? Break down the hiring process into role creation, role approval, applicant tracking/sourcing, screening, interviewing, and extending the offer. Which takes the most time? Where can the process be sped up? Most companies lose steam in screening and interviewing candidates. Set a deadline for onboarding the new hire. While most hiring cycles do not go exactly according to plan, having a deadline creates an incentive for good time management and fast responses. It is a common pitfall to subconsciously underestimate the time it takes to make the hire. Start by coordinating the schedules of everyone involved in making the hire. Most companies try to get too many people involved in the hiring process, which can create confusion and delays. Best practice is to include the person who will be directly managing the employee, someone who can drill them on the technical skills, and preferably one team member who would be working alongside them. If one of the hiring managers will be traveling, overloaded, or working on a complex project, consider reassessing the hiring timeline or cutting them out of the hiring process altogether. Good candidates may stick it out for a long hiring process, but most won’t. Sometimes, a long hiring cycle happens when a manager is afraid of hiring the wrong person. This is a valid concern, because bad hires are expensive—but so is a long hiring cycle. A delayed hire can mean expensive overtime, overworked team members, missed deadlines, or even falling behind in market competitiveness. For companies that work with recruiters (internal or external), an urgency bonus is a great incentive to keep things moving. The bonus should be enough to overcome the temptation to procrastinate, but not so big that the hiring manager is tempted to rush the hire. Most hiring managers want to hire someone with a similar industry background and skill mix, essentially, someone whose resume looks just like their own…minus 5 years of experience and 25% in salary, give or take. The reality is that it’s more comfortable to hire “mini me” people with a similar background, but the strongest and highest-performing teams are diverse—in strengths as well as in personality. Avoid “mini me” syndrome in a hiring cycle. The best teams have diverse work histories. The other pitfall to avoid is “queen bee” syndrome. It can be tempting to always go after the perfect candidate with the strongest career path, best leadership qualities, impeccable background, and every skill under the sun. Not only are these “queen bee” candidates rare and expensive, but they also often are not what is needed. Most teams are made up of worker bees. Resist the urge to insist on every skill, and assess what is truly needed in the role. In today’s market, there is a resistance to on-the-job training at nearly every seniority level. Many hiring managers overestimate the amount of experience they need in a candidate, but they underestimate what someone can learn on the job. Keep in mind that a newly hired person is more likely to put in extra hours and extra work to close their skills gap. In many cases, hiring managers wait around for an extra 3 months for the perfect candidate, when they could have hired someone slightly less senior and trained them on the job in less time than it took to find them. 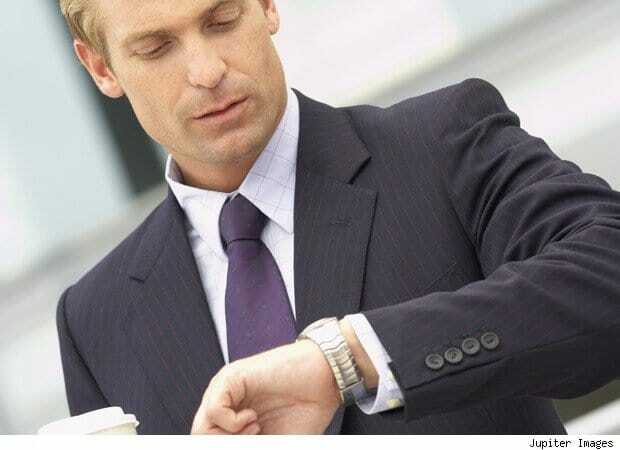 In the staffing industry, recruiters know that backfills nearly always get filled faster than newly created positions. In fact, many new roles change several times during the hiring process. Many never get filled at all. This is because backfill roles are under pressure to fill. Keep this in mind when creating a new role. It is a huge time drain to get everyone involved in a hiring project that may change three times and still take six months to fill. Most hiring managers prefer to focus on their projects, not on drawn-out hiring cycles. Cutting down the hiring cycle time benefits everyone. It takes dedication, so set multiple milestones if necessary. By slashing wasted time in the hiring process, companies will boost morale, get on top of projects faster, and hit their goals at a better rate than the competition. I was honest and admitted it only took about five seconds. He gasped on the other end of the phone and asked what I do with the people who don’t cut the mustard. I told him our process was telling candidates that they are not a fit for our current role, but that I will keep their information for other opportunities and imply that we will likely have something for them in the future. He calmed down, but pointed out that what really frustrates him is that quite a few hiring managers only look at resumes for a few seconds after many of them prolong the application process, which can take candidates multiple hours to submit. It is no longer just sending in a resume. He said it disgusts him that they are only spending five seconds looking at an application that likely took two hours to apply to. He made a great point; it’s not a fair tradeoff. This got me thinking; are we really being fair to people who want to work for us? Candidates have spent two hours of time filling out an application for the chance to join your company, yet we are only giving them five seconds of review before we make a decision. Today, everyone is talking about customer experience management; creating a consistent, desirable and differentiated experience across all touch-points with your organization. According to a Walker study, by the year 2020, customer experience will overtake price and products as the key brand differentiator. The reality is that every time you or someone in your company engages a customer, it creates an experience that they remember. A positive emotional experience anchors them to you, whereas a negative experience will encourage them to head straight to your competitor. Where are the hidden opportunities to add enough value for our customers that it begins to offset the effort they’ve expended for us, thus forging a more equitable exchange? But how do you encourage your customers to take the time to volunteer this type of feedback? You try to dangle a carrot. Entice them with a discount, money, gift card or future services. Valuable comments are only going to be offered if something is in it for them, right? Never is a customer going to say they will drop everything to give a company advice on their service. Everyone is money-driven, and everyone is time-driven. Yes, these are all positive ways to set your firm apart. But are they really differentiating? Probably not. I have learned over the years that if we ask the right questions and understand the client’s needs, we create better relationships and earn long term results. Over 90% of professionals won’t know the answers to these questions. But that is okay, because we as recruiters are here as sounding boards to help them better understand companies, industry trends, and even their own needs. At the end of the day, the most valuable reviews come from asking the right questions. No one truly tells you how to do things differently until they are upset or realize that things went wrong. When you think of customer experience management, are you really listening to your customer? Here at Blue Signal, we pride ourselves on asking the right questions and are always open to hearing how we can improve. Feel free to hear our full line of questions on the client side by reaching out at [email protected] . Job Ads Should Look More Like Dating Profiles – Here’s Why. Must do all chores (laundry, all cleaning, bills), plus more as needed. Must be willing to make sandwiches on demand and cook all meals 5+ times per week. Minimum 700+ credit score and excellent budgeting skills required. Must be able to handle difficult in-laws. Who would swipe right on a profile like that? Any sane suitor would swipe left on that person as if their life depended on it because no one in their right mind would list requirements like that on a dating profile. It just isn’t a feasible way to find a successful match. So why are job ads being written like this? Minimum 10 years of experience. MUST be willing to work long hours on nights and weekends. Must handle all regular duties plus others as needed. Self-starter who can work with minimal direction. Proven success in consistently landing top-level enterprise clients. Natural ability to thrive under high pressure. Please do not apply if you do not have qualifications listed above. More like a prison sentence than a job ad. Not a single top performer would be tempted to apply to a job like this, and yet this continues to be the standard in the job ad world. Instead of showcasing a company’s passion, mission, and opportunity, they aim to scare off all but the most dedicated candidates. Demanding job ads became the norm during the 2008 financial crisis. Job ads were full of intimidating lists of hefty requirements, because the labor market was so bad that even top people were willing to take any jobs they could get. The trouble is, this approach has stopped working. The economy has shifted to a candidate-driven market, and companies are finding that the talent market is more competitive than ever, especially in fast-growing market segments like emerging technology, wireless/telecom, and programming. And due to tightening work visa restrictions, employers cannot always rely on the pool of H-1B workers. As a result, companies are having a harder time attracting talent. Better to have too many choices than not enough. Of course, there are some non-negotiables in both dating and employment. Everyone has standards. But highlighting the negative aspects of the job to “scare away” unmotivated applicants will make a top candidate question why they would bother applying to an apparently horrible job. Experts estimate that up to 80% of candidates are passive. This means they keep options open but usually stay put unless something great comes along. Companies who write hardline job ads cut out 80% of their possible applicants. The best employees almost never have to make a career move, so companies with bad job descriptions automatically eliminate the best candidates right off the bat. 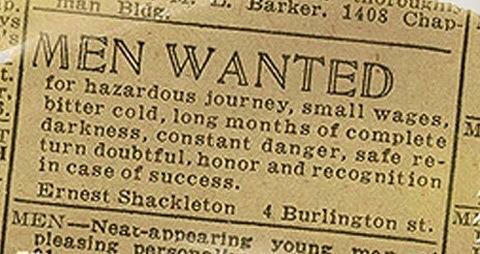 Image: Ernest Shackleton’s 1901 newspaper ad for the first successful trip to the South Pole. Writing more attractive job ads will naturally cause an uptick in the number of applicants. Sometimes this is the reason companies write harsh job ads – they want to reduce the flood of applications. However, this strategy is flawed. In the world of easy online applications, companies who demand too much will still get flooded with applicants, but the majority will be desperate or underqualified applicants. It is better to have too many choices than not enough. By the way, getting overwhelmed by applications is one of the best reasons to consider using a recruiter to weed through hundreds of applicants. Recruiter fees are expensive, but so is a hiring manager’s time. Focusing on the minimum qualifications is insulting to top candidates who have worked hard to build their skillset and bring extra to the job. Telling someone that they have met the minimum standard is hardly motivating in the dating world, and even less in the professional world. It is far better to tell them what the reward will be if they exceed expectations. Instead of focusing on the minimum bar, focus on the things that will set the job apart and how the company rewards its best people. If employees have to jump through hoops during the hiring process, expect to pay a lot more than market rate to attract high-performing employees. Even then, many people will eventually leave a high-paying job for a job that treats them well. High turnover might work for minimum-wage employees, but it gets very expensive for salaried employees. Consider the direct costs of replacing an employee (advertising the job, interviewing, travel costs, background checks, and onboarding), plus the indirect costs of low morale, poor branding, decreased service quality, and the negative effects of stressed and dissatisfied employees. Just like in real life, there is a spectrum of what works. Antagonistic, authoritarian work relationships can sometimes produce results (take Amazon’s notorious work culture, for example), but candidates in today’s market have lots of options. Companies who take a hardline attitude should not count on attracting top performers. Once upon a time, “Coding Ninja” job titles and ping-pong tables were the hottest way to attract up-and-coming talent. It worked for a while, but in the end, employees mostly want to make sure that a job will meet their real needs. That means money, time off, career advancement, and a good workplace environment. What should companies focus on instead? Start with opportunities, rewards for top performers, career paths, benefits, work culture, and brand ideals. The top attractors in the United States have strong branding around how they’re changing the world. They don’t always pay the most or have the best benefits, but they maintain strong ideals about their mission. Most companies only put effort into considering what they want out of an employee, and no time thinking about why anyone would want the job. This is unfortunate, because every company has something unique to offer. Start with the hard numbers, like salary package, benefits, PTO, and bonus structure. Go on Glassdoor to see what people are already saying, and pick out some of the top positive comments describing the culture. Plan out the realistic career path for the person who will fill this position, and note in the job description what opportunities they will have. Even the most formal professional relationships are still relationships. They are based on people understanding each other and cooperating. When someone takes a job, they sign up to spend hundreds or thousands of hours of their life to pursue the company’s goals, and the company agrees to be that employee’s livelihood. Investing in employees is expensive, but it also produces great results. Many studies have shown that unhappy employees do a bad job at work, and happy employees give better service. It takes time, effort, and hard work to attract top people, but the payoff is enormous. Want more tips on how to write a great job ad? Check out Blue Signal’s top 5 tips for building a better job description. Many sales reps are great interviewers, since they excel at building relationships and having targeted conversations. One of the best ways a sales rep can stand out from the competition in an interview is by asking great questions. Research the company’s products and brands well ahead of time (try out the products firsthand, if possible), and then spend the interview time asking questions that will help both parties to determine whether the job is a fit. These questions are designed to jumpstart conversation about company culture specifics. Listen carefully to what is said, and what is not said. Be ready for a range of possible answers, and have responses to guide the conversation. Sales roles often have high turnover, especially at the lower levels. But asking simply about tenure can give a bad impression in an interview. Instead of asking a question that focuses on the worst performers, ask about the best performers. This question does double-duty: it demonstrates a commitment to succeed, and it also uncovers how the company treats its highest-performing salespeople. Another variant on this question is, “What do the most successful salespeople do in their first month on the job?” Both variations of the question emphasize that the candidate has every intention of doing a good job. “If you had an extra 20% added to your budget, how would you spend it? An engaged hiring manager will know what they would love to spend more money on – product training, marketing materials, extra reps, prospecting software, or extra incentives, for example. There is no right or wrong answer to this question, but it will indicate the top priorities (and possible pain points) of the team’s management. Someone from a technical background may prioritize product knowledge and technical support. 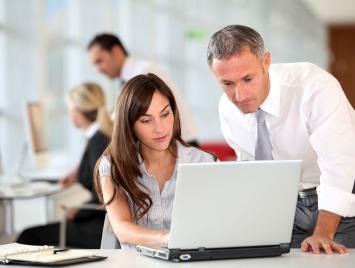 A manager who is actively engaged with their team may focus on skills development. A data-driven manager may invest in analytical software and tracking tools for the team to find out where the problem is. Listen carefully to the “why” in the interviewer’s answer, and think about what was not said as well as what was said. Every team has weaknesses, and most sales teams struggle with a similar set of challenges across the board. This question gives insight into which weaknesses the manager focuses on. Common answers to this question include: product knowledge, prospecting, actual salesmanship, and better documentation/follow-up. An engaged hiring manager will answer this question in detail because they know where the team’s weaknesses are. A sales rep who is interviewing can use this information to guide future questions, especially if they are strong in an area where the rest of the team is weak. It pays to follow up with a question about how the sales department compensates for this weakness—additional training, regular coaching, bigger incentives? It says a lot about the overall approach of the team. Some sales teams operate in a bubble and focus purely on selling, selling, selling. Other companies have a more collaborative culture, and their sales teams meet with R&D to brainstorm solutions to common customer complaints, or with marketing to come up with better materials and marketing strategies to help reps sell better. Neither approach is right or wrong, but it says a lot about how the company integrates sales into the rest of its culture. Sales is not an easy line of work, and it gets even harder when reps are bogged down with non-sales work. 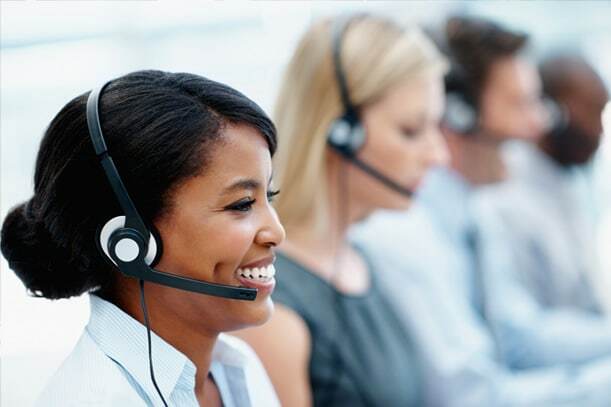 Support personnel help a sales team to run like clockwork. This includes sales engineers, technical support, customer service, admin, data entry, product managers, and pre-sales/post-sales support coordinators. Even a small number of support personnel can mean a huge difference in a rep’s workload, and that translates to more sales and more commissions. Not all sales departments set realistic quotas for their team. If the annual quota is $5 million, but the average rep only closes $3 million, the target is unrealistic. A very high OTE is great, but only if it is achievable. This question also helps to feel out how in touch a hiring manager is with their team’s numbers. It pays to know how the top 10% performs compared to the average rep, to get a realistic idea of how much to expect in sales and commissions. This question gives the hiring manager a good opportunity to talk about what tools and procedures the company uses in its sales process. A good sales funnel is straightforward and simple. Beware of a complicated process with unnecessary twists and turns. Another red flag is a high amount of follow-up, which takes a rep’s time away from selling. Get an idea of the company’s sales stack. Even the best salesperson can have a hard time selling if the company’s software platform is outdated or difficult to use. On the other hand, a modern fully-loaded CRM shows that the company is serious about investing in its sales team. The easy answer to this question is, “We’re growing,” which is what most hiring managers will answer. But instead of stopping there, dig a little deeper. Ask how much they have grown, and how it compares to past growth. Why now? This is also a good opportunity to find out the size of the sales team. The other possible answer is that someone left. This is not automatically a bad thing – the hiring process usually moves much faster for replacement roles than for newly created roles. If the role is open because someone resigned, see how the hiring manager responds. If they speak negatively about the employee or air grievances (which tends to be uncommon), take it as a red flag. The best professional response is to briefly explain that the person moved on to other opportunities. The sales profession is not easy, especially in the roller-coaster market of the past 10 years. Every team has faced challenges. Find out how they responded, and more importantly, how the hiring manager speaks about the difficulties on the job. Some managers ignore or minimize problems, some face them head-on, some like to get their hands dirty on the front lines, and others like to analyze the problem carefully and take a targeted approach. Again, this question is all about getting down to the personality and work culture of the team. Selling is a numbers game, and a great hiring manager is on top of their team’s metrics. Good metrics to talk about include the cost of acquiring a new customer, conversion rates, and average deal size. For long-cycle sales, be sure to get an estimate of how long deals usually take to close. The interviewee should have their own numbers ready to discuss, so that once the hiring manager begins talking about their metrics, the interviewee can respond with how they can improve those metrics. This is a good opportunity to trade stories about big milestones and key successes in the past few years. This is an easy one to pull out to break tension or to follow a complex question. People who work in sales are all about motivation and excitement (if not, they are probably in the wrong profession). What they say is less important than how they say it. If their answer is motivating and exciting, they are probably a good match. Interviewing soon? Read more about how to excel in a sales interview. Find even more interview tips here. The original purpose of small cells was to efficiently reuse spectrum as a capacity solution – not as a replacement for cell towers. However, outdoor small cell use as a coverage solution has grown significantly, both in rural areas and dense urban areas. While DAS and low-power small cells are well suited for indoor applications like office buildings and open-air venues like stadiums, high-power small cells are gaining ground in outdoor applications. Carriers have found that it is cheaper to densify and reuse spectrum rather than buy new blocks of spectrum for macrocell coverages. The major takeaway is that network providers and customers are taking a more nuanced view of coverage that includes a mix of small cell types and power levels to provide efficient, reliable coverage and a better handling of capacity. Small cells still cannot beat the distance and power of macrocells (1 macro tower equals 10-30 small cells), but small cells are a cheap and effective way to patch coverage holes (at least for now — the maintenance and backhaul costs are still significant). Verizon is investing heavily in small cell densification in preparation for 5G and to support larger capacity demands. It has announced that it will begin commercial deployments this year. 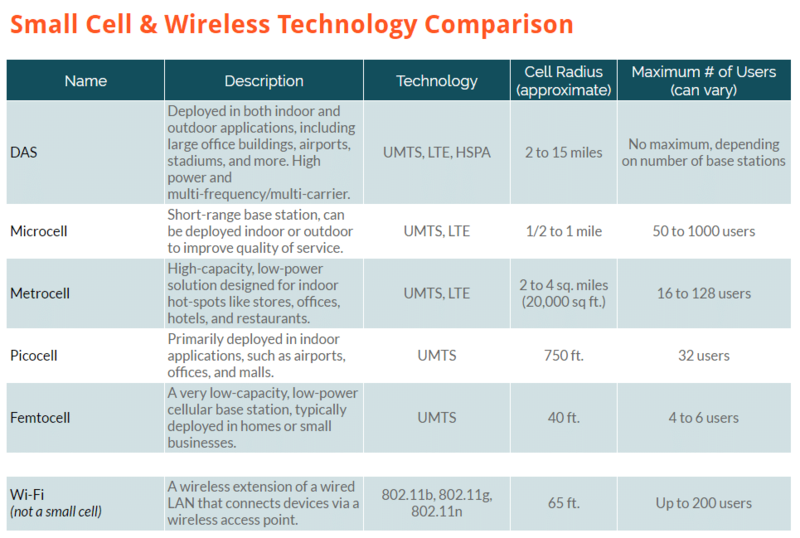 Chart: Small cells include a mix of indoor/outdoor and high/low power solutions. Small cells improve network coverage and/or capacity. Wi-Fi is included for comparison, but is not considered small cell. Only two-thirds of new small cells are indoor, and the rest are deployed in outdoor environments. The United States is a hotbed for telecom innovation, but international demand is growing strongly as well. In the next two years, outdoor small cell is projected to jump 600%. By contrast, indoor/in-building solutions are projected to grow only 400%. One important point to note: this small cell definition includes femtocells, whose cell radius is usually less than 50 feet and can service about 5 users at once. While femtocells do technically qualify as DRAN small cells, their application differs from other members of the small cell family. It is surprising to think of Wi-Fi as an obsolete technology, but industry trends show that Wi-Fi may be on a downward slope. It used to be that only a lucky few had access to unlimited data plans, usually grandfathered from years past. Today, unlimited data plans have made a comeback. T-Mobile, Verizon, Sprint, and AT&T all offer unlimited data plans. Slower speeds have replaced overage charges for heavy data users. LTE’s biggest advantage over Wi-Fi is that LTE can be taken anywhere (and Wi-Fi, which is an extension of LAN, will never be as mobile as LTE). As data usage climbs, people expect to use all of their devices everywhere, and finding a Wi-Fi hotspot becomes more of a burden. Coffee shops and public areas are less enthusiastic about footing the bill for Wi-Fi when many customers only buy a cup of coffee and use the network for hours. Wi-Fi technology is fussy and less secure than LTE. As security becomes more and more of an issue, customers are likely to demand LTE-based solutions over Wi-Fi. This trend will accelerate as expanding technology offers more options for less money. Unlimited data is not the only competitor to Wi-Fi. Carriers are rushing to densify networks and expand unlicensed spectrum coverage, a family that includes LTE-U, LAA, and MuLTEfire. Wi-Fi is becoming more of a niche technology than the go-to. LTE-U (deployments in the US, Korea, and India) and LAA (deployments in the EU, Japan, and others) use unlicensed spectrum aggregated with licensed spectrum as a Wi-Fi coexistence strategy. They improve the signal without interfering with Wi-Fi. MuLTEfire, by contrast, is LTE realized fully in unlicensed spectrum, and it poses the most serious threat to Wi-Fi. The technology may advance to the point where customers can install a private LTE router in their homes, just like Wi-Fi but with the added benefits of LTE. If the price is comparable to Wi-Fi coverage, this could make home Wi-Fi coverage obsolete. All the way back to 1993, data usage has never dropped. Growth has accelerated year over year as carriers continue to throw money into network expansion, mostly on outdoor small cell technology to keep costs down and allow for future compatibility with 5G devices. 5G is projected to unseat (or at least compete strongly) with Wi-Fi, especially when it comes to connected devices. Connected devices are compatible with Wi-Fi and LTE, but 5G is specifically designed for compatibility with connected devices. This may prove to be the downfall of Wi-Fi. One opposing viewpoint is Wi-Fi is not going anywhere. As new technology emerges within LTE, Wi-Fi technology is also evolving. New Wi-Fi technologies are closer to carrier-grade — and carriers still rely heavily on their ability to offload on Wi-Fi. Image: Voice traffic growth has been flat since 2011, while data consumption has jumped over 1300%. Graph: Akamai’s Q2-2016 State of the Internet Report. data from Ericsson’s Mobility Report. One opposing viewpoint is Wi-Fi is not going anywhere. As new technology emerges within LTE, Wi-Fi technology is also evolving. New Wi-Fi technologies are closer to carrier-grade — and carriers still rely heavily on their ability to offload on Wi-Fi. Many regulations are outdated, obsolete, and have no guidelines for the newest technology, including small cells. This hits hardest at the local level, where budgets are tight and laws can be slow to change. Many local municipalities do not have the resources to keep up with telecom technology that is changing at lightning speeds, let alone revamp the regulations. Carriers are expecting the FCC to streamline municipal telecom regulations this year to ease the administrative and financial burden of installing small cells, towers, and other network infrastructure. Currently, many cities classify small cells the same as macrocell towers, even though the two technologies have totally different footprints, sizes, and expense. A tower can be hundreds of feet tall, while a small cell can be the size of a lunchbox. However, some cities charge the same fees for both. Some companies have attempted to classify their solutions as public utilities to save themselves hefty permit costs and administrative roadblocks. Despite some difficulties, there are success stories. The city of Orlando, FL recently accepted bids for a large-scale small cell installation to improve coverage in the city. Some municipalities, especially in tech-friendly large urban areas, are moving ahead with ambitious small cell projects. Laws are changing to better accommodate new technologies. The city of Philadelphia worked with AT&T and Verizon to deploy a 37-node small cell network in anticipation of Pope Francis’s visit in September 2015. The project took only 9 months from start to finish. It was able to proceed thanks to huge public demand and pressure for the city and the telecom companies to work together to achieve a mutual goal. The distance between IoT and small cell is shrinking. As Wi-Fi dependence begins to drop, network providers will need to build more and more IoT/M2M functionality into network designs (especially as 5G comes closer to being a reality). M2M connections are expected to make up almost half of all connected devices by 2020. Specifically, companies will be looking for people with hands-on experience within the IoT value chain. This includes IoT platform design, smart object design, module design, and integration with 3rd party applications. Because of spectrum limitations, 5G will deploy on a very high frequency, including mmW. This means that traditional cell towers cannot deploy that spectrum, even with advanced beam-forming techniques. Small cells are the only way to deploy the mmW spectrum. This means carriers will have to deploy small cells—possibly on the order of millions—within the next 10 years. Since small cells have design, maintenance, and repair needs just like macrocells, there will be a huge uptick in field work, engineering, construction, and related job duties. This is one of the biggest looming talent shortages. The IoT/M2M/5G space will create millions of jobs — some estimate over 4 million IoT developer jobs alone by 2020. However, experts also expect that IoT and connected device technology will severely disrupt the labor market. Millions of people who work low-level jobs in fast food, retail, transportation, and supply chain will be displaced. Infrastructure sharing is a growing trend while the telecom landscape continues to shift rapidly. There will be a very high demand for employees who can understand and build strategy around shared infrastructure. This will be especially true in the next five years as networks complete coverage expansion projects. European markets had another record year in 2016 for colocation data center capacity. Colocation promotes standardization and harmony between carriers’ data/voice technology, which is good for the consumer and the industry. Demand will continue to increase for employees with a sound understanding of existing 3GPP standards, as well as foresight for how standards may evolve to accommodate emerging technology. In an increasingly crowded network, interference is one of the top challenges for high-traffic networks. Managing interference and higher spectrum utilization techniques will be a key goal for network providers, integrators, colocation facilities, and product developers, with applications at almost every level. Demand for this skill will rise fastest among design engineers and product managers. Expect strong demand for sales engineers who can explain interference mitigation technology to potential customers. While private sector companies are scrambling to upgrade their networks, the public sector is more uneven in its acceptance of new telecom technology. With the challenge of previously mentioned regulatory hurdles, telecom firms need to arm themselves with persuasive and highly knowledgeable salespeople. A strong salesperson can effectively navigate administrative roadblocks and match municipal requirements with network solutions that work. By contrast, some public sector entities are way ahead, aggressively updating building and fire codes with new wireless standards. Companies who win key installation deals early on are more likely to enjoy repeat business and maintenance contracts from the same customers. If your company is searching for small cell talent, contact us for a free evaluation of your hiring needs. Reach our telecom specialist directly at [email protected]. Before You Hire an AWS/Cloud Engineer, Read This. Cloud computing is growing faster than ever. The cloud market reached almost $150 billion in 2016, and is growing at 25% annually. Traditionally, companies’ top concern was security. But this year, the #1 challenge reported by cloud adopters is a lack of people with the right skills. At the forefront is Amazon Web Services (AWS), the public cloud division of Amazon. Their business-friendly cloud options ranked #1 in Gartner’s Magic Quadrant. AWS has been around since 1999, however, with the spike in cloud migrations, demand for qualified people has exploded. The natural response is to scramble to get approval for a new top AWS/cloud migration expert. But many companies run into trouble by hiring the wrong type of person, hiring without a plan, or hiring before their infrastructure is ready. This leads to poor retention and an expensive cloud-based disaster. AWS has many modules; its tagline is “A platform for virtually every use case.” It is the CTO’s job to set a goal and narrow the focus. Too many companies jump into new technology because everyone seems to be doing it, but the reality is that no project can succeed without a clear, realistic goal. The worst possible approach is, “We need to invest in cloud. What should we do with it?” The goal should address an existing problem that ties directly to revenue. For instance: streamlining a data center, improving security, speeding up data processing, or meeting compliance standards. AWS and cloud-based technology cannot solve every problem, but it brings many exciting tools to the table. Cloud technology is not an all-or-nothing investment. After defining the goal, choose the features and modules that make sense. For many companies, a hybrid solution is best for their needs, especially for companies with existing infrastructure and assets. 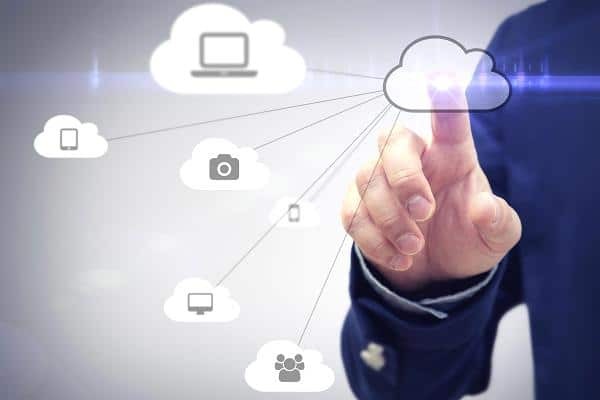 Smaller companies can simply rent or buy into existing cloud platforms and software, especially for data storage and security needs. Enterprises and companies doing large cloud migrations will more likely need to hire an expert. Without a clear leader to head up the effort, a cloud project will quickly fall apart and become a chaotic, over-budget mess. A director or department head may seem like the obvious choice, however it may not be the best choice if this person already has a totally full schedule, travels a lot, or does not understand the technology. The best person to lead is someone who is highly project-oriented and a big-picture strategist who communicates well with many types of people. Someone detail-oriented risks getting lost in the weeds. Ideally, they have technical experience or manage technical people. With the groundwork in place, the hiring need should be clearer. Before interviewing, know the right questions to ask, and have at least one interviewer who can ask technical questions on the AWS technology. This is for two reasons: it screens out underqualified candidates, and it gives the interviewing company legitimacy. Experts gravitate towards companies who have done their research and ask the right questions. It is an indication that the company will treat them well and respect their expertise. Beware of hiring a complete team of outside people to manage a brand new big-budget technology project. Even if they are experts in the technology, they are not familiar with the company culture and team. Even the best person can run into problems if current employees perceive that an “outsider” is coming in and trying to change everything overnight. A more neutral strategy is to hire an engineer or architect who reports to a trusted leader within the organization who can act as the liaison. Train some, hire some. Who can be retrained? Competition is so fierce that some companies will inevitably be stuck with a person who has the technical skills but is not the best cultural fit, or vice versa. Therefore, the lower the budget, the greater the need for flexibility. Work to change technophobe attitudes before the project starts. Share responsibility and ownership in the project with the whole team, and get as many people as possible on board. Take their ideas and try them out, where possible. New technology can feel like a threat and a burden, so open communication does wonders to make current employees feel more at ease. Lastly, have a follow-through plan. 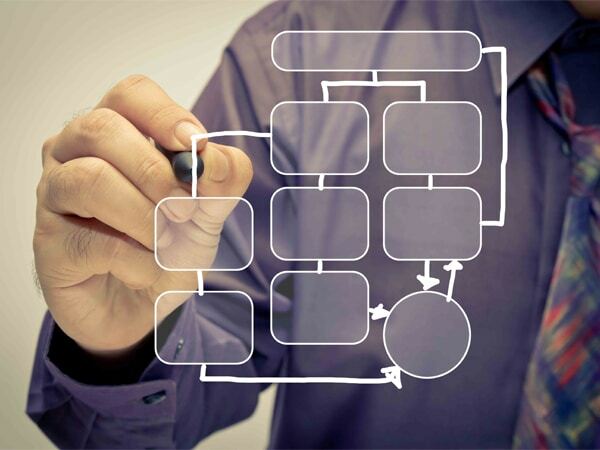 Once the cloud project is complete, have a plan in place for who will maintain it and run it. Hire or train them with plenty of time. Success in the early stages is critical for employees to get on board. As with any complex project, it pays to work with a recruiter who knows the space well and can locate the best talent for the company’s budget. If your company is considering a large-scale cloud or AWS project, contact us for a free evaluation of your hiring needs. Reach our cloud specialist Aileen directly at [email protected]. “Highly motivated” is a common requirement on job descriptions, but in reality, “built-in” motivation is a myth. While an employee’s internal drive is important, the other half of the equation is a joint effort by the employee and the manager to foster a productive workplace. Employee engagement is a top buzzword of recent years, and there are many obvious killers of motivation: below-market pay, crushing workload, delayed wages, unfair management practices, and oppressive bureaucracy. But for highly paid top performers, some team managers miss more subtle killers of motivation. In an increasingly competitive job market, these top employees have more options than ever, so it is important to address motivation killers and build a productive, healthy environment that lets high performers shine. In the modern high-level interview, hiring managers often ask for a prospective employee’s career goals. Not everyone wants to go into management, so this interview question is critical in uncovering what motivates the employee. However, many managers never follow up on this initial conversation. Regularly discussing where the employee wants to go and how to get there is important, but it is only the start. High achievers are good at setting and reaching goals, so they need to have measurable targets to hit and a specific timeline. If an employee feels they are indefinitely treading water, or that they have no prospects for advancement at their current company, they will move on. Tip the balance by giving top performers a realistic idea of their growth timeline and what they can expect as a reward for their hard work. High performers often have well-rounded communication skills and are good at coping with set-backs and frustrations. That said, a toxic work environment will quickly frustrate someone who is trying to focus on achieving good results in their job. A sudden change in an employee’s performance or an abrupt drop-off in communication is a telltale sign of a toxic situation. Toxic workplaces kill employee engagement. Promptly address conflict. Meet face-to-face with involved employees and be prepared to discuss what is bothering them in honest, blunt terms. Many times, good communication with a mediator will take the fire out of a bad situation. At other times, more drastic measures are required. Either way, when a top employee is sending distress signals, ignoring the problem destroys trust along with motivation. When employees come up with new ideas and find new ways of doing things, it is a sure sign that they have good motivation and are engaged in their jobs. A quick way to kill that motivation is to gloss over their ideas. 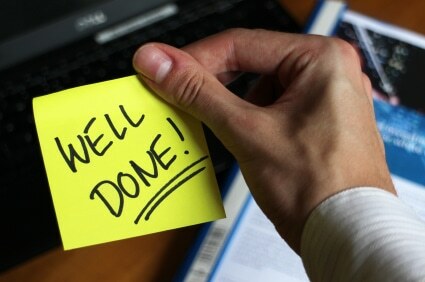 Even if the idea is totally unworkable, enthusiastic acknowledgement of their effort is critical. Meet regularly with high-performing employees, not just to assess performance, but to build trust so that the employee feels confident enough to share new ideas. Top performers often provide advice that is just as good as a pricey consultant. A company rarely has a bad reputation without something else being wrong. Negative press or a poor financial outlook can cause employees to start searching before a crisis hits. This correlation is stronger with senior executives. Executives are generally more in tune with market conditions and the company’s industry reputation. Senior employees are also impacted more strongly by performance-based bonuses and budget cuts, so a stream of bad press can jumpstart a new job search. Interestingly, the past few years have seen the market become much more politicized. In a report titled “The Dawn of CEO Activism,” KRC Research found that almost 40% of American consumers say CEOs have a responsibility to publicly address hot-button political issues. Depending on whether employees support or oppose their company’s views, political involvement can bolster or kill motivation. Senior executives in particular may come under fire for comments by the company, or have to clean up messes as a result of an unpopular comment. In fast-moving industries with shorter tenure, especially technology, top performers look ahead to make sure that the experience they are building now can get them a job down the road. Tech professionals have learned the hard way that even giants like Myspace and Netscape can hit hard times and turn a star resume into one that looks dated and unfashionable. Top performers are less of a flight risk than underperformers. However, sudden departures are often due to missing out on a promotion or award. If a hiring manager is interviewing internally and interviews three top performers for a juicy promotion, and only one of them gets it, the hiring manager risks losing his other two top performers. The solution is to take time to give them a good explanation as to why they were passed over. Reevaluate their career path within the organization together with them. Ironically, top employees sometimes leave because of a promotion or salary increase! The HR analytics software Workday found that a significant percentage of high-performing employees had a higher risk of leaving the company after a promotion. After transitioning into the new role, the employee runs into one of the problems above. The employee takes on more responsibility than they could manage. The promotion or raise comes too late or fails to meet expectations. The new job title or award makes the employee more attractive to recruiters or motivates them to explore even better options outside the company. When interviewing internal candidates for a high-level position, it is critical to spend time with the rejected candidates to reevaluate their growth plan within the company, so they do not take it as a sign to move on. Networking is still the #1 way that people get a new job or advance at their current one. It is important to help top employees build mentor relationships within the company. A mentor fulfills many roles in an employee’s professional life: they coach, train, give advice, brainstorm, encourage, and correct. Having strong professional relationships within an organization is a powerful incentive for a high achiever to work hard and stay with the company. By contrast, companies who fail to invest in their top employees’ growth lose twice. Their top people gravitate to the competition, and they fail to attract top employees to replace them. Today’s employee knows that demand for new skills is fierce. Top employees have to reinvent themselves several times in the course of their careers. If an employer is not investing their skills, they lose the motivation to invest their best effort in growing the company. A mediocre employee will happily take a paycheck without enough work to keep them busy. Top performers want to be challenged. Even if an employee believes wholeheartedly in the company’s mission and loves their work, they will quickly become frustrated if they are bored or perceive that their work is unimportant. If a high performer is consistently hitting goals without much effort, they have outgrown their current role. It can be tempting to keep them where they are to save the cost of replacing them when they move up the ladder, but this will frustrate the employee and usually lead to a drop in performance or a resignation letter. Reward employees’ growth by helping them to reach their desired career goals. Many employees would rather leave than complain, so pay attention to early warning signs. Do not rely on employees to set their own workloads. It is the manager’s job to invest time in the employee to match their workload to their ability, drive, and personality. Find out what aspects of a project or of a client the employee enjoys working with, and seek out ways to maximize it for that employee. The investment is well worth it. Motivated employees who like their jobs will happily go to bat for their company to get the best results. Change is difficult, and even top employees are reluctant to jump into a long job search process that may or may not pay off. A high performer will send many signs before they feel frustrated enough to start job-searching. Employee engagement takes an investment of time, thought, and resources. But the reward is that a manager who engages employees will have far better results to show than a manager who focuses on the results instead of on the people who produce them. Recruiters sometimes have a reputation for reaching out at inconvenient times. It can be tempting just to delete the LinkedIn message or reject the call. But overcoming that natural aversion and taking the call can pay big dividends. Many companies cannot keep up with the flood of resumes in response to their job postings, and they use recruiters to fill their most critical openings. Many of the top openings are never even posted on job boards. Successful people know that a good recruiter can hold the key to their next great role. There are four professionals that everyone should know before they need them: a doctor, a lawyer, an accountant, and a recruiter. A crisis is not a good time to be looking for one of these people! Take a call when things are good. Candidates who wait until they desperately need to change jobs often find themselves boxed in without many great options. They get free market intelligence. Some recruiters are generalists, but most have a specialty focus. Recruiter who hire within a specialized niche are tuned into which parts of the market are growing, and who will be hiring or firing in the near future. A good recruiter relies on industry news to drive their business. They can pass on that industry news to hard-working candidates who might not have time to catch up on the market trends. It’s a good investment of time. An investment of 10 minutes can turn into a dream job. Not only that, it can pay big money. Employees get an average pay increase of 8-11% when they change jobs. This is a lot more than the 3-5% annual raises offered by most companies. Young workers see the biggest gains when they change jobs. The hiring manager’s company pays the recruiter, so the candidate benefits from a recruiter’s hard work for free. It never hurts to listen. Searching for a job is stressful even in the best of times, but a recruiter does a lot of the difficult leg-work, including getting the attention of the hiring manager, negotiating salary and relocation packages, selling the candidate’s skills, and coordinating all of the logistics. Passive talent gets the best jobs. “Passive talent” is a buzzword that has gained popularity in the recruiting world in recent years. Hiring managers have come to understand that top performers almost never need to leave their job, and are more likely to be passive in their job searches. Often, hiring managers are willing to pay more for passive talent. Not only are they willing to pay a fee to a recruiter, they often have higher salaries than advertised job postings. Many companies cannot keep up with the flood of unqualified applications that come with job postings, so often a recruiter is their best path to top candidates. They can double-check their career strategy. Successful people have a set of written goals to map out their career. However, no one has a perfect perspective of the industry. Many employees have no mentor for their careers. A recruiter’s job is to talk to a lot of people, usually at a high level. They can give valuable insight on what is happening in the industry, as well as general workplace trends. Is it too soon to ask for a raise? What technologies are up and coming? Is it better to change jobs for growth, or stay put to avoid job-hopping? A specialized recruiter can answer these questions and more. Recruiters often know industry salaries better than the hiring managers. Managers who do a lot of hiring often have a very good idea of the market rates. However, most hiring managers only hire a few people per year, and many have limited information about current salary ranges. Since it is in the recruiter’s best interest to get the candidate the highest possible salary, candidates can learn where their salary falls with regards to the market rate. They can also discuss what salary range to ask for. While some jobs naturally develop good negotiation skills, like sales, candidates in industries like technology and engineering often do not get as much opportunity to hone their negotiation skills. A recruiter can not only give them salary information, they often do the negotiation on the candidate’s behalf. Online job applications require a lot of information—name, current company, and often salary. Working with a recruiter adds a layer of privacy for candidates in small industries. Ask a recruiter on the first call what their confidentiality policy is. Good recruiters work with NDAs and can run protected searches that keep the client and/or candidate names confidential throughout the process. It pays to work with recruiters with strong confidentiality policies and to have a signed confidentiality agreement in place to protect everyone involved. They know what upgrades they want. No job is perfect. Top employees know the benefits and shortfalls of their current role, so that if something significantly better comes along, they can quickly evaluate it and act decisively. Every candidate has slightly different priorities: work-life balance, shorter commute, salary, benefits package, company culture, location, or more exciting projects. Candidates who talk to recruiters regularly are more likely to know what they want and to have clearly defined career goals, preparing them to handle any crisis that might come up. Not every recruiter’s call will lead to a job change, but that is not the only benefit. Candidates owe it to themselves, their families, and their careers to keep an open mind about potential opportunities. It is a time investment that more than pays for itself.